The process of bidding for the host city was originally scheduled to begin in 2019, with the winning bid due to be announced in 2021. However, following the withdrawal of a number of cities from the bidding process for both the 2022 Winter Olympics and the 2024 Summer Olympics, the International Olympic Committee (IOC) resolved in July 2017 to jointly award both the 2024 and 2028 Games. Thus on July 31, 2017, an agreement was reached wherein Los Angeles would bid for the 2028 Games with $1.8 billion of additional funding from the IOC, which then cleared the way for Paris to be confirmed as host of the 2024 Games. Both cities were formally announced as winners of their respective Games at the 131st IOC Session in Lima, Peru, on September 13, 2017. The bid was praised by the IOC for using a record-breaking number of existing and temporary facilities and relying on corporate money. This is the third time that Los Angeles will have hosted the Summer Olympics, making it the third city after London (1908, 1948, and 2012) and Paris (1900, 1924, and 2024) to host the Games three times and the first American city to do so. These will be the fifth Summer Olympic Games to be hosted in the United States, the previous four occasions being St. Louis 1904, Los Angeles 1932, Los Angeles 1984, and Atlanta 1996. These will also be the fourth Olympics to be held in the U.S. state of California, and the ninth Olympics to be held in the U.S. overall (taking both summer and winter Games into account; the four winter editions being Lake Placid 1932, Squaw Valley 1960, Lake Placid 1980, and Salt Lake City 2002). On September 16, 2015, the International Olympic Committee announced five candidate cities for the 2024 Games: Budapest, Hamburg, Los Angeles, Paris, and Rome. The candidature process was announced at the same time. Budapest, Hamburg, and Rome eventually withdrew their bids, leaving only Los Angeles and Paris. A similar situation had already occurred during the bidding for the 2022 Winter Olympics when Krakow, Lviv, Oslo and Stockholm withdrew, resulting in a two-way race between Beijing, China and Almaty, Kazakhstan, where Beijing was ultimately declared the winner. On April 3, 2017 at the IOC convention in Denmark, Olympic officials met with bid committees from both Los Angeles and Paris to discuss the possibility of naming two winners in the competition to host the 2024 Summer Games. After these withdrawals, the IOC Executive Board met in Lausanne, Switzerland to discuss the 2024 and 2028 bid processes on June 9, 2017. The IOC formally proposed electing the 2024 and 2028 Olympic host cities at the same time in 2017, a proposal that was approved by an Extraordinary IOC Session on July 11, 2017 in Lausanne. The IOC set up a process where the Los Angeles and Paris 2024 bid committees, and the IOC held meetings in July 2017 to decide which city would host in 2024 and who would host in 2028. Following the decision to award the 2024 and 2028 Games simultaneously, Paris was understood to be the preferred host for the 2024 Games. On July 31, 2017, the IOC announced Los Angeles as the sole candidate for the 2028 Games, allowing Paris to be confirmed as the host city for the 2024 Games. On August 11, 2017, the Los Angeles City Council voted unanimously to approve the bid. On September 11, 2017, Los Angeles received formal approval to host the 2028 Games from the IOC's evaluation commission. On September 13, 2017, Los Angeles was formally awarded the 2028 Games following a unanimous vote by the IOC. On October 16, 2017, Los Angeles 2028 received official support from the state of California. On August 29, 2018, Olympic officials arrived for a two-day visit that included meetings with local organizers and a tour of the city's newest venues. On October 9, 2018, a movement called NOlympics LA released poll results stating that 45% of respondents from Los Angeles County and 47% from across California oppose bringing the 2028 Summer Games to Los Angeles. However, a different poll suggests that more than 88% of Angelenos are in favor of the city's hosting the 2028 Olympic and Paralympic Games. Los Angeles was elected as host city for the 2028 Summer Olympics at the 131st IOC Session in Lima, Peru on September 13, 2017. The three American IOC members, Anita DeFrantz, Angela Ruggiero and Larry Probst, were not eligible to vote in this election under the rules of the Olympic Charter. This was the third time that Los Angeles had been selected as an Olympics host city without facing a competitive bidding process (Los Angeles being the only city to hold this distinction), following similar outcomes in 1932 and 1984. Los Angeles also submitted bids for the Summer Olympics in 1924, 1928, 1948, 1952, 1956, 1976 and 1980, but lost out to Paris, Amsterdam, London, Helsinki, Melbourne, Montreal and Moscow respectively. More recently, Los Angeles applied to be the U.S. candidate city for the 2016 Summer Olympics, but on that occasion Chicago was chosen as U.S. candidate by the United States Olympic Committee (USOC). While most host cities have seven years to prepare for the Olympic Games, Los Angeles will see an additional four years, giving the city eleven years for preparations. 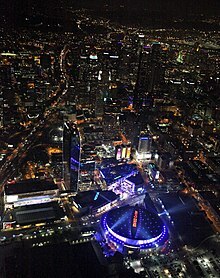 The Los Angeles bid relied on a majority of existing venues; other venues that are already under construction were planned regardless of the Games. Banc of California Stadium, which opened in 2018 as the home of Major League Soccer's Los Angeles FC, will host football (soccer) and several events in athletics. Los Angeles Stadium at Hollywood Park, home of the NFL's Los Angeles Rams and Los Angeles Chargers upon its completion in 2020, will host the main opening ceremony, football and archery. Around the time when Los Angeles won its bid, the Los Angeles Clippers proposed building a new arena in Inglewood. However, this venue has not yet been approved and has yet to be mentioned as a potential Olympic venue. The Los Angeles Memorial Coliseum is currently undergoing a major program of renovation and restoration. A new press box and suites, loge boxes, and club seats are being installed. This work is expected to be completed in 2019, when the venue will be renamed the "United Airlines Memorial Coliseum". Future renovations also include the re-installation of an athletics track. The Twenty-eight by '28 initiative is an effort set forth by Mayor Eric Garcetti that the City of Los Angeles complete 28 transit infrastructure projects before the start of ceremonies. Most of these projects were already in the planning stages but will receive accelerated priority, while several new projects were programmed with the initiative. In 2019, the Crenshaw/LAX Line is expected to open and will be fully completed by 2021. It will link the Crenshaw District, Inglewood and Westchester once completed. The Crenshaw/LAX line will also connect to a people mover being constructed to link Los Angeles International Airport with the Aviation/96th Street station. The construction of the people mover will be expedited in anticipation of the 2028 Olympics, with a completion date of 2023 being set. The LAX people mover started construction in early 2018 and the Crenshaw Line is currently 75% completed (as of March 2018). While various infrastructure improvements were planned regardless of the outcome of the Los Angeles Olympic bid, the extension of the Metro Purple Line will be expedited to serve the 2028 Olympics, with a targeted completion date of 2024. The first phase will extend the Purple Line from the Wilshire/Western station to the new Wilshire/La Cienega Blvd. station. This phase will be completed by 2023. The second phase will extend the Purple Line to Century City by 2025, while the third and final phase will extend the line to the West Los Angeles VA Medical Center in Westwood with a completion date set for 2026. The third phase will also include a station adjoining the UCLA campus, connecting the Olympic village and Pauley Pavilion with venues in downtown Los Angeles. Currently phase one and two are under construction and phase three has received its federal funding in September 2018. Construction of phase three is scheduled to begin late 2019. The Regional Connector in downtown Los Angeles will be complete in 2021. The project will connect the Metro Expo Line, which already links venues in Downtown Santa Monica to venues at Exposition Park and in downtown Los Angeles, to the Metro Gold Line. This will allow for direct rail service between Santa Monica and East Los Angeles. 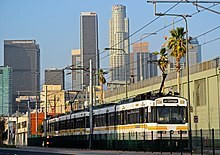 The Regional Connector will also link the Metro Blue Line with the Metro Gold Line, connecting the Long Beach area and San Gabriel Valley via downtown. These infrastructure improvements, among others, are being funded by "Measure R", a temporary half-cent sales tax increase, and "Measure M", a continuation of Measure R's tax increase plus an additional permanent half-cent sales tax increase, both tax measures applicable to Los Angeles County. Measure R was approved by voters in November 2008 and Measure M was approved by voters in November 2016. The Downtown Los Angeles sports park will incorporate various venues around downtown Los Angeles. Multiple venues will be located at LA Live, Exposition Park and the campus of the University of Southern California. The Valley Sports Park will be centered around the Sepulveda Dam in the San Fernando Valley. The South Bay Sports Park will be located on the campus of California State University, Dominguez Hills in Carson, California. The Long Beach Sports Park will be located in and around Downtown Long Beach in Long Beach, California. According to the initial bid book for the Los Angeles 2024 Olympic bid, football venues are to be situated within Los Angeles and other parts of California, to be determined. According to the official website of the local organizing committee, eight venues are under consideration, all within the state of California. In January 2017, it was reported that the LA 2028 organizing committee had proposed the use of both the new Los Angeles Stadium at Hollywood Park in Inglewood, California, and the historic Los Angeles Memorial Coliseum, during the Games' opening and closing ceremonies. The committee proposed that a segment of the opening ceremony be held at the Coliseum, including the launch of the final stage of the torch relay. The torch would then travel on to Inglewood, where the main opening ceremony (including the parade of nations and other traditional protocol) would be held. Other entertainment would be provided to spectators at the Coliseum, including a simulcast of the main portion of the ceremony taking place at Inglewood. Finally, the historic Olympic cauldron at the Coliseum would be symbolically re-ignited upon the lighting of the Olympic cauldron in Inglewood. Sixteen days later, the closing ceremony would be held in reverse, with an opening segment in Inglewood, and the formal protocol (including the extinguishing of the cauldron) taking place at the Coliseum. In the United States, the 2028 Games will be broadcast by NBCUniversal properties, as part of long-term agreements with the IOC through 2032. The NBC Universal Studio Lot is planned to be the site of the International Broadcast Centre for the Games. In addition, NBCUniversal and the organizing committee will coordinate sponsorship sales for the Games. ^ Abend, Lisa (October 3, 2014). "Why Nobody Wants to Host the 2022 Winter Olympics". Time. Retrieved September 20, 2015. ^ Butler, Nick. "Exclusive: IOC vow to "further adjust" candidature process after Budapest 2024 withdrawal". Inside the Games. Retrieved August 1, 2017. ^ a b "Meeting of the IOC Executive Board in Lausanne – Information for the media". Olympic.org. 19 May 2017. Archived from the original on 22 June 2017. ^ "Los Angeles Declares Candidature for Olympic Games 2028- IOC to Contribute USD 1.8Billion to the Local Organising Committee". IOC. Retrieved August 1, 2017. ^ "Candidature Process Olympic Games 2024" (PDF). Retrieved March 1, 2017. ^ "L.A. City Council endorses 2028 Olympics bid, accepting responsibility for any cost overruns". Los Angeles Times. August 2017. Retrieved August 11, 2017. ^ "Los Angeles gets official go-ahead to host 2028 Olympics". Chicago Tribune. September 2017. Retrieved September 11, 2017. ^ "L.A. officially awarded 2028 Olympic Games". Los Angeles Times. September 2017. Retrieved September 13, 2017. ^ "State taxpayers will back L.A. Olympics bid if it goes over budget". Los Angeles Times. October 2017. Retrieved October 17, 2017. ^ "Olympic officials visit L.A. for the first time since awarding the bid and are impressed so far with what's to come". Los Angeles Times. August 2018. Retrieved August 29, 2018. ^ "New poll suggests L.A. residents concerned about hosting 2028 Olympics". Los Angeles Times. October 2018. Retrieved October 12, 2017. ^ "LA 2024 Olympic bid receives wide public support in new poll". Los Angeles Times. February 2016. Retrieved February 23, 2016. ^ reports, From NBA media. "LA Clippers owner Steve Ballmer still seeking Inglewood arena for team - NBA.com". nba.com. ^ "Inglewood residents sue to block Clippers arena". curbed.com. ^ "See the Changes Coming to the Historic LA Memorial Coliseum". NBCUniversal Media. January 29, 2018. Retrieved March 22, 2018. ^ "Renovated Coliseum Press Box to be Named Otis Booth Press Box". The Coliseum Renovation Project. Retrieved April 14, 2018. ^ "United Airlines Memorial Coliseum to be new name for L.A. landmark - USC News. January 29, 2018". www.usc.edu. ^ "Renderings Galore for the LAX Automated People Mover". Urbanize.la. February 2018. Retrieved February 25, 2018. ^ "Agenda for March 22 meeting of Metro Board of Directors". metro.net. March 21, 2018. ^ a b "Purple Line phase 2 groundbreaking!". metro.net. February 23, 2018. ^ Nelson, Laura J. (September 9, 2015). "Eyeing L.A.'s Olympic bid, Metro seeks to accelerate two rail projects". Los Angeles Times. Retrieved September 12, 2015. ^ Devanney, Brenna (November 12, 2015). "Metro Proposes Budget Changes To Regional Connector". Annenberg TV News. Retrieved January 24, 2016. ^ "Regional Connector Transit Corridor (project website)". Metro (LACMTA). May 13, 2013. Retrieved July 11, 2013. ^ "LA County Election Results". www.lavote.net. ^ "LA County Election Results". www.lavote.net. Retrieved November 25, 2016. ^ "Stage 1 Vision, Games Concept and Strategy" (PDF). Archived (PDF) from the original on October 12, 2016. Retrieved July 1, 2017. ^ a b Johnson, Ted (June 22, 2016). "Universal to Build New Soundstage Complex, Expand Theme Park in 5-Year Plan (EXCLUSIVE)". Archived from the original on August 27, 2016. ^ "LA2024 Games Delivery, Experience and Venue Legacy" (PDF). Archived (PDF) from the original on February 4, 2017. ^ "IOC awards Olympic Games broadcast rights to NBCUniversal through to 2032". International Olympic Committee. May 7, 2014. Retrieved August 27, 2017. ^ "LA 2028 and NBCUniversal partner for Olympic sponsorship sales". SportsPro. Retrieved April 18, 2019.